Admiral - News - Galveston pirate to wear Admiral. Galveston pirate to wear Admiral. Galveston. 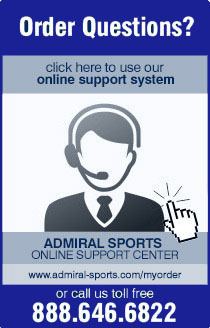 (Jan 15th, 2012) Galveston Pirate is pleased to announce that Admiral, the Original British Football brand to American and England’s top teams. Admiral, will be official supplier to Galveston Pirate Soccer Club a semi-professional soccer club based in Galveston, Texas from the start of the 2012 Season. The club play in the NPSL soccer league considered the 4th level of soccer in the United States, after Major League Soccer, North American Soccer League (NASL), and the United Soccer Leagues Professional Division (USL Pro). Admiral is the same brand that provided team wear in the 1970’s and 1980’s for the England football teams, Manchester United, Tottenham Hotspur, West Ham, Southampton and Leeds in the English Premier League. Admiral was also the market leader in the United States on the shirts of the Los Angeles Aztecs, Tampa Bay Rowdies and Vancouver Whitecaps. Players who have worn Admiral include soccer legends Pele and Beckenbauer while they played for the New York Cosmos. The 2011 North American Soccer League (NASL) Champions Minnesota Stars, Puerto Rico Islanders also of the NASL and current Caribbean champions, wear Admiral in addition to Charlotte Eagles of the USL Pro league. Other champions wearing Admiral include; Kitsap Pumas this years USL PDL champions, championship winning beach soccer team Florida Beach Soccer and Bolivian Premier League Champions Club Bolivar. “You’ll see Admiral returning to the field in leagues across America, Galveston are one of many NPSL teams we’re working with this season. They are a great club and really develop their players because they have one of the most experienced management coaches in the league”… says Paul Hamburger, CEO of Admiral Soccer. “The USA is one of the biggest soccer markets in the world and Texas is one of the biggest soccer states in the US. We’re delighted to support soccer in Galveston and plan to build relationships with teams across the state." Head coach Brendan Keyes, played in two of Ireland's best teams (Home Farm, Stella Marris) and in the USA for the Huston Eagles, the Force and the Hurricanes; as well as the State Select Team and has served as an Olympic Development Coach since 1996 volunteering for US Youth Soccer’s outreach program for soccer. “Admiral is the oldest soccer brand in the world, with nearly 100 years of heritage. We are proud to be associated with the original soccer brand. Especially one strongly associated with some of the best teams in the world….” “We selected Admiral from a number of leading brands because their custom product is fantastic and their service is excellent, but also because we feel that Admiral is focused on supporting quality of soccer in the USA.” Said Keyes.